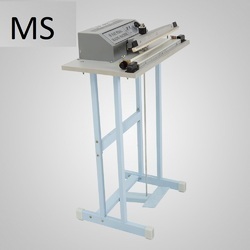 We at MS Machinery a leading manufacturer of Manual Sealing Machine , Fusing, Heat press, and other textile printing machine. This fully automatic L-Sealer is a user friendly and high speed-packing machine for sealing or take off. The in feed and out feed of the product from the machine is all conversed. The products is placed in the in feed conveyor from where it moves on to the sealing area with the help of fractional power motors. A special hot knife sealing system is been used for perfect quality seal and cutting. Motorized film unwinding and scrap rewinding used are the latest in its kind. We are the leading manufacturer and supplier for DIRECT HEAT SEALER HEAT SEALERS (also known as constant heat sealers) are best suited to seal thicker material such as coated aluminum foil, Kraft paper, cellophane, mylar, or coated PP. our direct heat sealers cannot seal polyethylene. Our direct heat sealers are equipped with a thermostat or an electronic temperature controller to accurately controls the temperature. Both jaws are heated simultaneously resulting in better heat penetration to seal thicker materials. Easy to operate. Set the temperature on the temperature controller depending on the material to be sealed. Our company has been acknowledged in offering Foil Sealing Machine to the clients. This product is manufactured at up-to-date manufacturing unit under the guidance of experienced professionals by making use of supreme quality raw material. Offered range is used to seal plastic jars demanded in pharmaceutical, food processing and other allied industries. 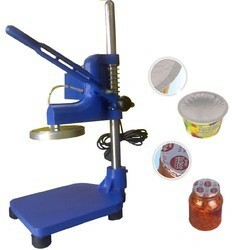 Aluminum Foil Sealer is made available in different specifications and various sizes. Offered range is widely used for leak proof sealing of aluminum foils on cups. We feel proud to introduce ourselves as the leading manufacturer and supplier of premium class range of Heat Sealing Machine. The Machine is suitable for sealing & packing of single, double & multilayer pouches. It is widely used in different fields such as pharmaceutical, spices, aromatics & many repacking units. Also, in order to ensure its performance and functionality, this machine is stringently tested by our quality auditors on defined parameters before delivering at our precious customers' end. The machine is a manual hand operated machine. It is used for sealing the mouth of the containers like PP, LD, HDPE, PET, etc using aluminium foil sheet. This machine seals the containers by heat seal method. This machine comes in varies models as per the clients apllication. We are providing our esteemed clients with excellent quality of Manual Sealing Machine . Offered sealer is manufactured using high-grade components and modern machinery by our skilled engineers. 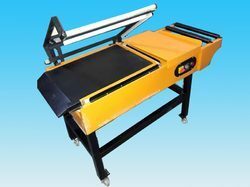 The offered machine is available in different models and other related specifications, in order to meet variegated expectations of our valuable customers. Our provided range is widely used for sealing of various plastic jars and bottles. Furthermore, our clients can avail this machine from us at market leading prices. 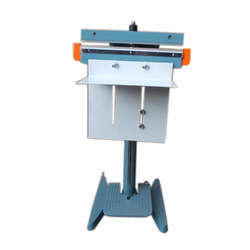 We are involve in offering superior quality of Foot Sealer Machine. 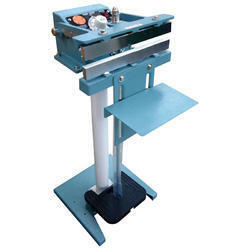 These pedal operated sealing machine are made from high quality of raw material which ensure durability at its user end. These products are available in market at most economical rates. Looking for Manual Sealing Machine ?